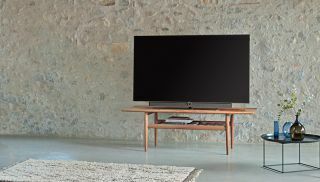 Loewe launches bild 5 OLED TV | What Hi-Fi? Loewe's latest stylish TV comes in two finishes, and packs HDR and Dolby Vision for great picture quality. Stylish tech always looks great, but sometimes it can be a case of style over substance. Not with the Loewe bild 5 though - as well as looking swish, it has an OLED screen along with HDR and Dolby Vision tech inside. In other words, the on-screen picture should look as good as the set itself. And it is quite a looker. Its angular design has a distinct whiff of the 60s about it, which is complemented by the use of natural materials. The man behind it is Bodo Sperlein, Loewe's creative director, who has overseen many of its previous designs. The bild 5 comes in two finishes: natural silver oak, or high-gloss piano black. It's impressively slim too, standing just 4mm fat. But it's not all about the looks. The OLED tech doesn't require backlighting, meaning it should have fantastic black levels. HDR adds a real sense of depth to the picture, while Dolby Vision makes for better picture quality than standard HDR10. On the audio side, it boasts a built-in 5.1 multi-channel decoder and digital audio link, making it simple to add speakers and a subwoofer. You can then controll it all from the TV remote. It comes in 55in and 65in sizes, with pricing starting at £2,990.